Another way to add files is by selecting file and then clicking "watch folder" to choose a folder to put on watch. 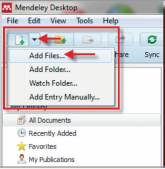 Mendeley Desktop will now automatically add files that are added to that folder. When reading an article click the export button then choose "Save to Mendeley"
Manual entry of a bibliographic reference can be completed in both the Mendeley Desktop and Web versions. See the link below for instructions for importing your Endnote, RefWorks or Zotero library into Mendeley.